Shari Unplugged | Sharing an outlet for my thoughts as I travel this wonderful thing called life. Shari Unplugged – Sharing an outlet for my thoughts as I travel this wonderful thing called life. Sharing an outlet for my thoughts as I travel this wonderful thing called life. One thing is sure; One Direction is much more than a boy band. Last spring I was looking for music on YouTube for a project and came across a band whose name I was only vaguely familiar with. I watched a clip of One Direction performing on the XFactor, and though I was a grown woman who wasn’t into pop music, I found myself going through their XFactor journey and watching the whole thing from beginning to end. I totally fell in love with them. Their enthusiasm, their personalities, their hope, their cohesiveness, set them apart from other bands; I used “One Thing” for my project. Then I saw the Video Diaries, and my heart was transfixed by two of the boys who seemed to have a special chemistry. One thing led to another, and I found multiple videos that introduced me to Larry Stylinson…Louis and Harry…and the idea that they had something more than friendship for each other. I was amazed that it had been five years and people were still having discussions and debates about this on social media. I can’t tell you how moved and intrigued I was, and the following week I spent going back and forth on how I felt about it. One Direction converged on my life, and never had my heart been pulled in so many directions in so short a time. At one point I had decided that the whole shipping thing was wrong…but ultimately things I had seen, things my heart told me, and that space deep in my heart and gut that speaks to me won over; media narratives just became white noise. When the song “Home” was leaked and the released last October, I couldn’t stop listening to it because there was only one way it made sense to me and was beautifully written…the music, the lyrics…everything about it. This song deserves so much more recognition than it received, and ProjectHome is an amazing effort put for by fans to get the song some well-deserved promo and air time…especially in the face of a lot of up and downs the fandom experienced. The way people came together to make this happen is very special. One thing was sure; One Direction had made a real impact on their fans. This wasn’t just another “boy band” that played nice, catchy music. 1D is a force that is paving the way for many fans, and Rainbow Direction is a testament to that. They started as boys, and have grown into young men, and their journey has been music but much more than music. One Direction has the power to move, to shake the status quo, to inspire, and though sometimes the different factions in the fandom have been at odds, it is a testimony of the power One Direction has for change. There have been some heated discussions between these factions, especially recently, but I chose to think of it as evidence of the impact this band has made. For myself, they have truly changed the way I think and how I view the world around me. Whether what my heart tells me about Larry is true or not, my soul has been cleansed deep down from every last drop of left-over bigotry, and my support for the LGBTQ+ community goes down to the core of me. 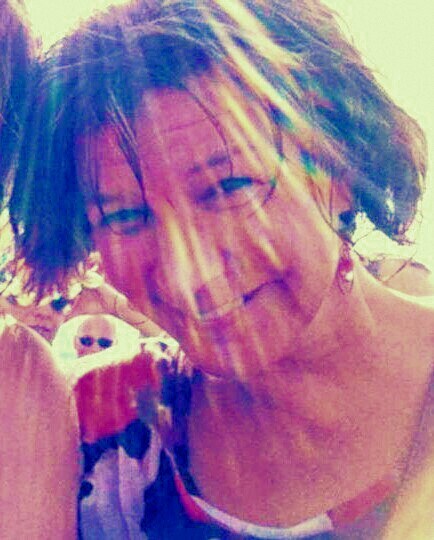 My peace of mind doesn’t depend on being “right” about Larry; I would never put that pressure on the boys. I just want them to know that no matter what, their existence was put together by a higher force than anyone or anything on this earth. Fate destined for them to come together, and the people responsible were merely tools of a higher power to make it happen. Thank you One Direction. Though you have no doubt been through a lot in the past six years, I believe you will come back stronger than ever. Know that you are loved and appreciated for your music and so much more. There once appeared a unique and beautiful jewel. The jewel had such a pure, bright light that it could shine through walls…and everybody near and far saw it and wondered at its rays. Some simply chose to bask and delight in its brilliance; others wanted to understand the jewel, and diligently sought to dissect and label it. Still others were blinded because the light was too bright for them, and tried only to douse it. Then there were those so attracted to the light that they were compelled to throw themselves and add upon it, ultimately only selfishly serving to distort it. The beautiful jewel sadly began to retract its rays one by one…until the circle of its path grew very small…and the light dimmed. Those dissecting and labelling closed their books. Those who had been blinded removed their dark glasses. Those who added upon it continued with reckless abandon. And many of those who had simply delighted in its light wondered where it had gone. 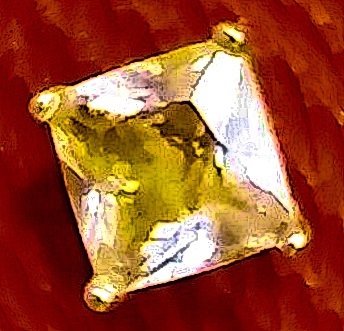 Perhaps those closest to the jewel didn’t realize how precious it was. The jewel still exists; I believe the light of its energy still simmers. PERHAPS some day the jewel will shine once more in its full brilliance, and we will all take joy in it. So says young Daniel, played by Mark Lester, to his new-found sweetheart Melody, played by Tracy Hyde, in this golden coming of age story. He coins the phrase “old miseries” to describe most of the adults in his life. Indeed. 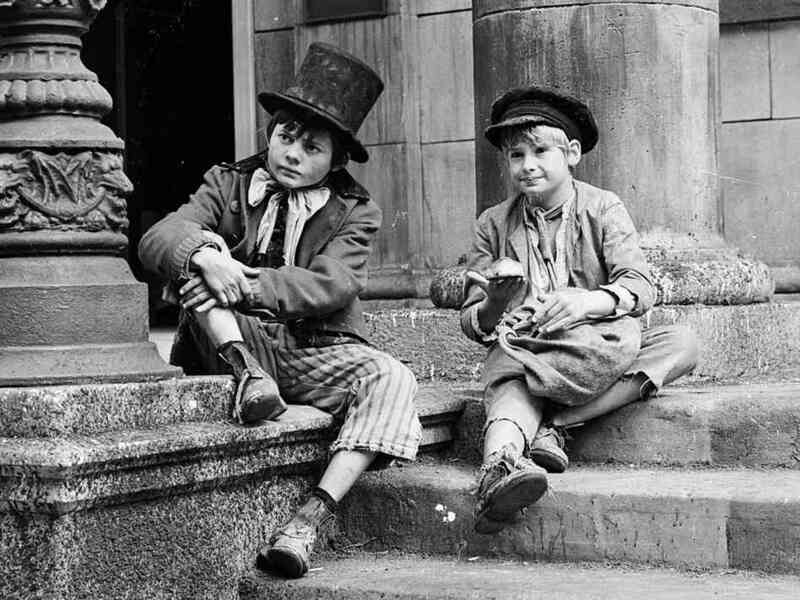 At the beginning of this tale, Ornshaw, played by Jack Wild, befriends Daniel and they strike up a close friendship. If Jack had been given the proper praise and acclaim that he should have for this role, I would have heard about the film long ago while still a young girl; I would have had eyes only for Jack as he breezed across the screen. Instead, I only happened to come across it on YouTube last year; a lucky find that upon my initial viewing stirred a sentimental soup pot of emotion and smile for the boys from “Oliver!” Then I watched it again. I discovered, with growing wonderment, that there was much more to Ornshaw than the cheeky, adorable kid, (although that is reason enough to like the film!) I found in Ornshaw’s character a deep well of subtle, multi-faceted vulnerable loveliness, and Jack’s performance an exquisite treasure. What a shame that it wasn’t in every theater across America. There is also more to Daniel than just falling into puppy love with Melody, (although THAT is reason enough to like the film.) You have to cheer Daniel on in his sincere, young quest to discover his own path – even though his journey ultimately leaves Ornshaw with some heartache; heartache that the viewer acutely shares. where adults get all up in arms because of an innocent childhood wedding officiated by another kid. Our young heroes in “Melody” work things out themselves in this moving coming of age tale; sometimes with their own form of rebellion, but mostly with true friendships that endure confusion and defy class separation, potential grudges that die before they take root, and most of all…love, in so many wonderful outside-the-box ways. The movie is a timeless classic that brings a lot of relevance to today’s table, one that is easily, and should be, revisited often. One question it begs me to ask is how did ours become a world in which some teenagers would prefer to end their precious life rather than be open and secure in the knowledge that they are beautiful just as they are? We ought to go back to the age of our innocence, to see the beauty outside the box, to create a world where life is embraced. Just had to share my thoughts on a film that I think is quite the masterpiece. If you’ve never seen the 1971 movie “Melody,” I highly recommend doing what you have to in order to get a copy of this five-star gem. The movie is often described as being “a movie about puppy love,” referring to the charming story line about Daniel Latimer and Melody Perkins. 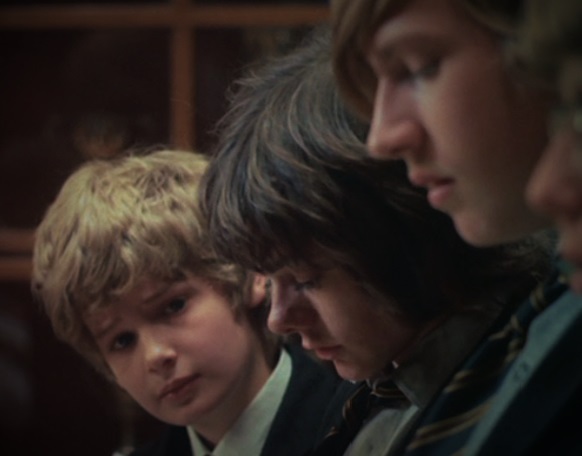 I believe the movie, which came out 44 years ago, is more about the close friendship between Ornshaw and Daniel, played exquisitely by the late Jack Wild and Mark Lester; it is simply a story about love. Melody, played by Tracy Hyde, plays a pivotal role in affecting that friendship. The movie is aptly named “Melody” because she is the centerpiece that the boys trip over-the catalyst that stirs and causes emotions to rise and tumble forth in all their beauty, pain, and angst, as love often does to challenge its bearers. There are many types of love, you may point out. Love isn’t always so simple; what type of love am I talking about? The type of love that cannot hold a grudge, even though there have been all types of pain inflicted. Not only are grudges lifted, but this love will inspire one injured party to stand up with the other in support of the other’s happiness. Against such love there can be no law. All of this is in the movie “Melody?” This is what I have experienced, all spread out before me like a banquet for the soul; this and Bee Gees hit music to take you there. If “Melody” fans have missed any of it, I encourage you to go back and watch again. I think this is what the movie “Melody” is all about; and it doesn’t sound like puppy love to me. 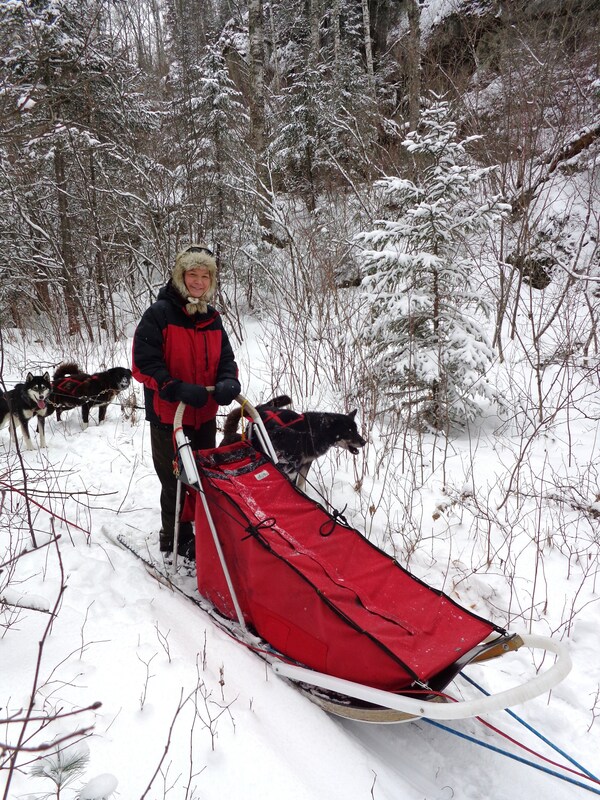 My incredible first day on the trail with “White Wilderness Sled Dog Adventures” was turning out to be everything I hoped it would be. Wind and blowing snowflakes whipped my face as I breezed down a long, steep hill. 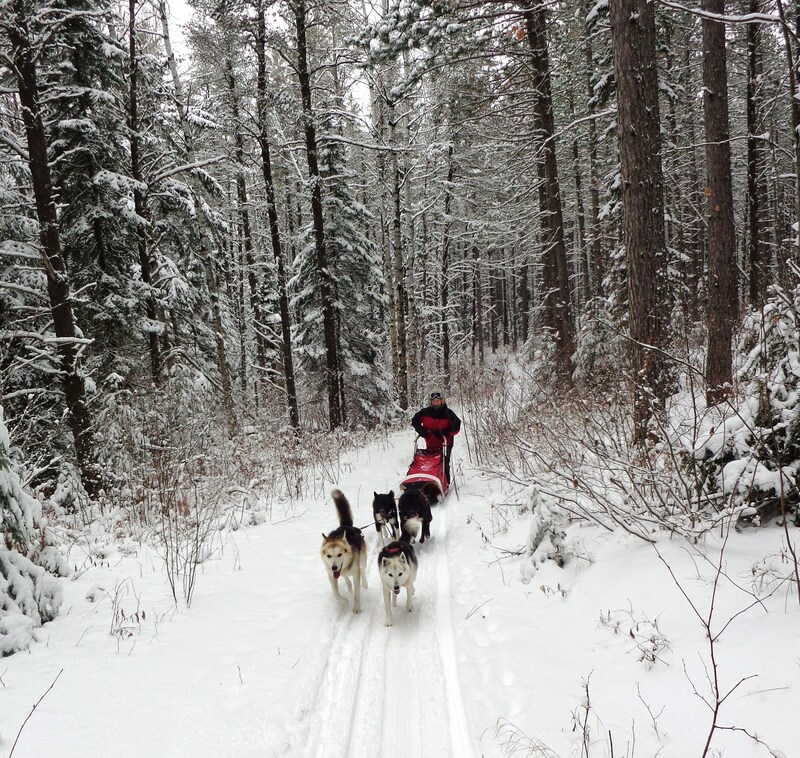 The dogs pulling my sled were engaged in a fast, joyous run, fresh-fallen snow flying up behind their feet, tails high, heads bobbing. 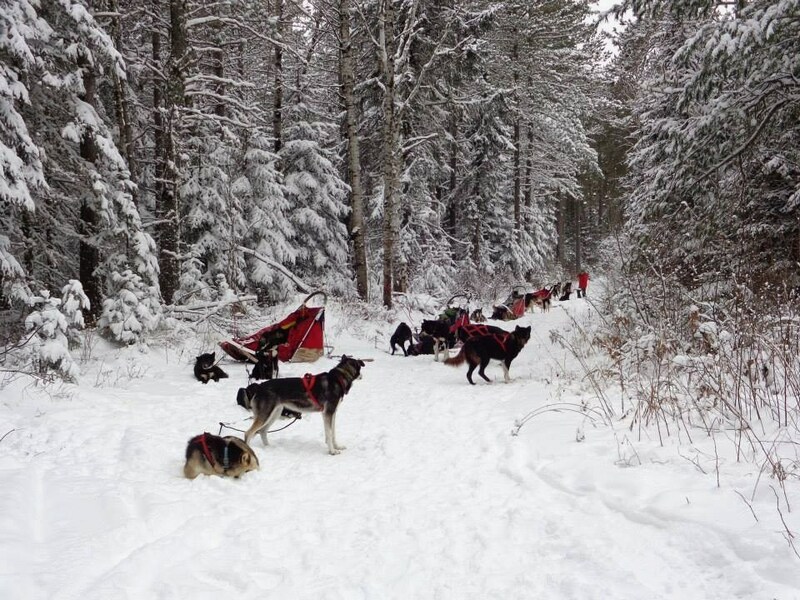 I was riding the back runners behind the sled driving my own team of dogs. 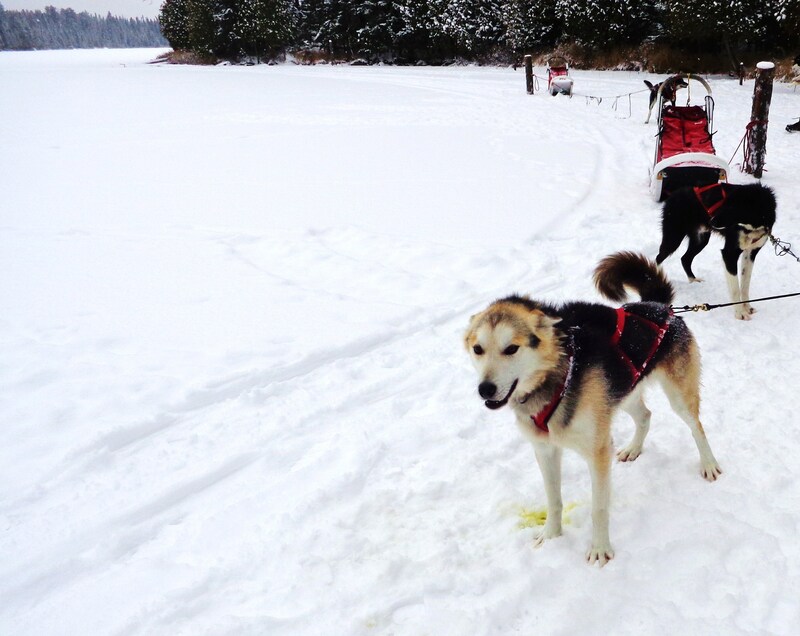 One foot balanced on a runner, while the other put pressure on a rubber traction flap between the runners known as the break pad; this kept the sled’s speed in check enough to prevent it from colliding with the dogs. At the bottom of the hill the trail disappeared going into a wide turn. 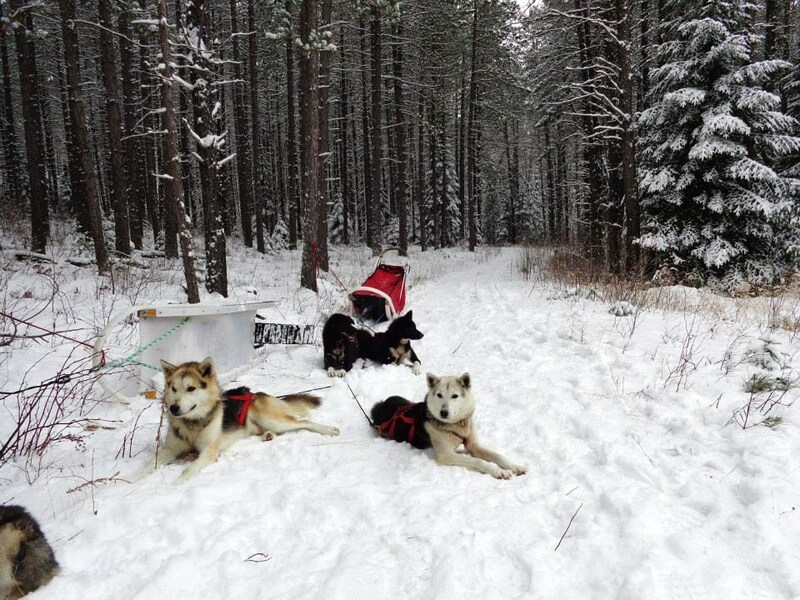 “Remember, you can’t ride the break pad around the turn,” one of the guides called over her shoulder with a friendly reminder, as that would have messed with the dogs’ ability to navigate. I gingerly moved my foot from the brake pad to the other runner, gripped the sled’s handles a bit tighter, and leaned in for the turn; on my face, I’m sure, was a smile was so wide the Cheshire cat would have been impressed. After making it around the corner intact, I felt like I had just made it down Mt. Crumpit. 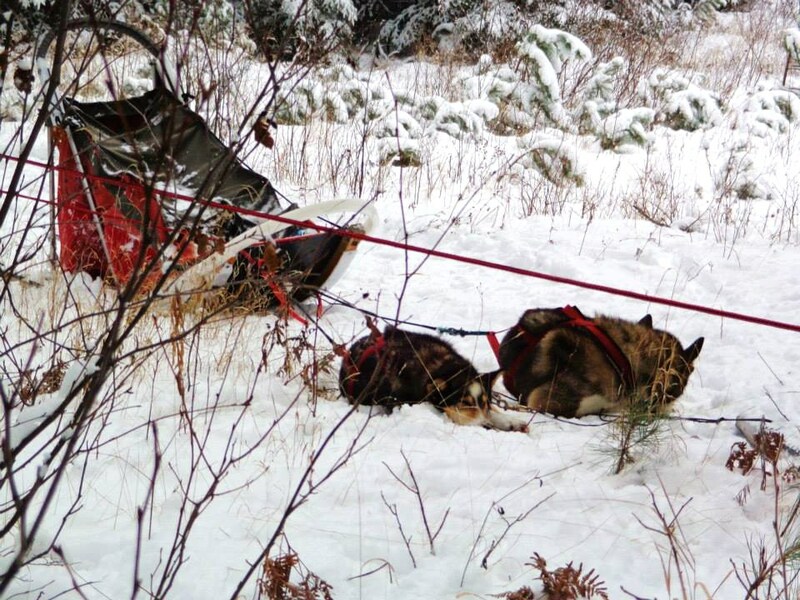 The foot that had been on the brake pad now found its way to the snow along the sled, digging in and helping the canine engine make it to the top. Whoo-wee! This was definitely a team sport, one in which all parties participate and experience feelings of good-rush accomplishment. At the top we could see another upcoming down-hill slope. All the while we reveled in the beauty around us, where fresh-fallen snow clung to every branch in a brilliant, winter-wonderland display. What I hadn’t wanted was a passive ride in a sled driven by someone else; I wanted my own experience, and White Wilderness delivered. I was on an excursion, and the best part was, I had two full days ahead of me! 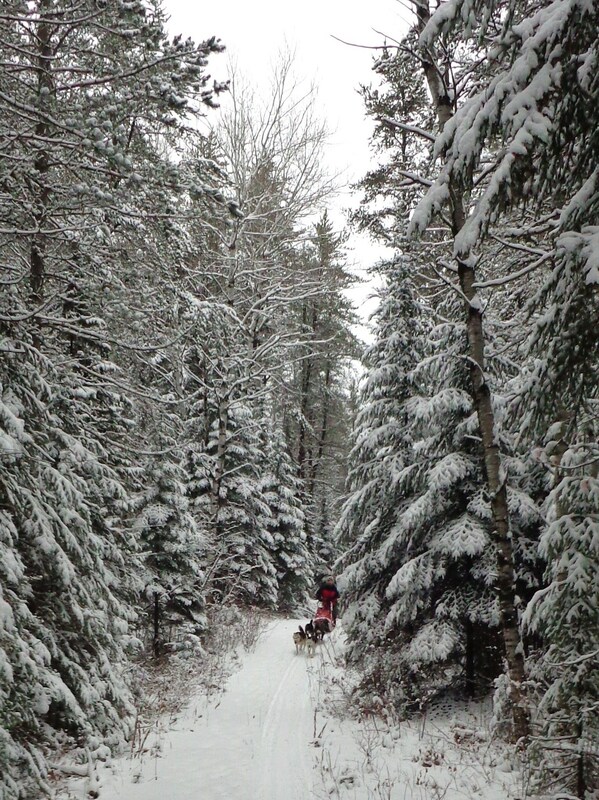 The weekend, though, was about much more than just being on the sled; the whole experience called to me. I was looking forward to open campfires, the woods, harnessing the dogs, spending three unadulterated days away from the rat race and all its stressors; away from my electronics, the clock, Facebook, phone, work, and any other symbol of the crazy bustle of civilization. 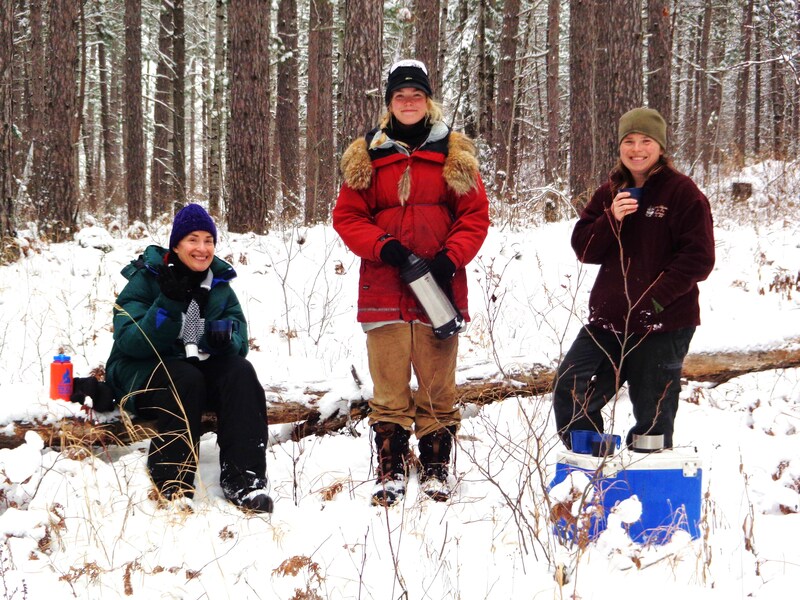 How can you go wrong in the Ely, MN wilderness? I was far from disappointed. 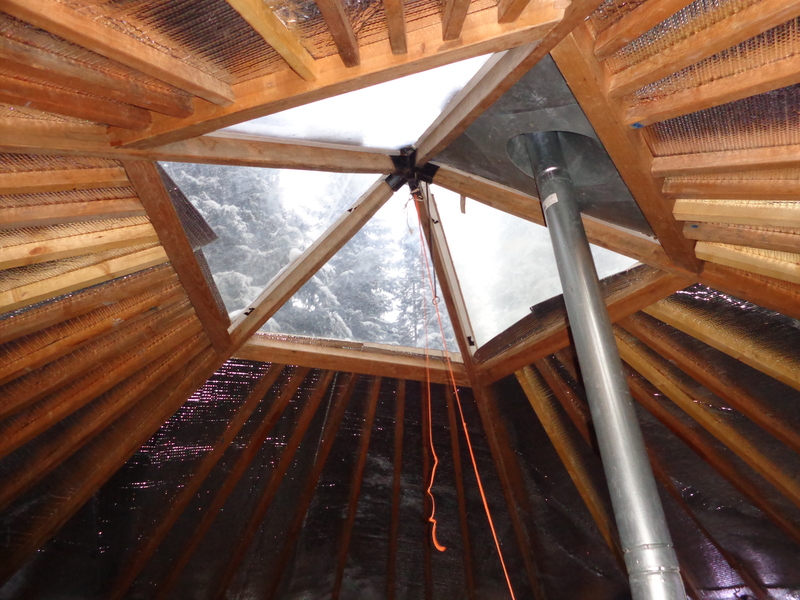 I chose this particular trip because of the two nights we would be spending in what is called a yurt; a mobile structure made of a wooden frame and thick insulated canvas, containing snug, warm winter sleeping bags on cots. A propane stove with a chimney exiting the skylight ceiling heated the dwelling, which also had a kitchen area for cooking. 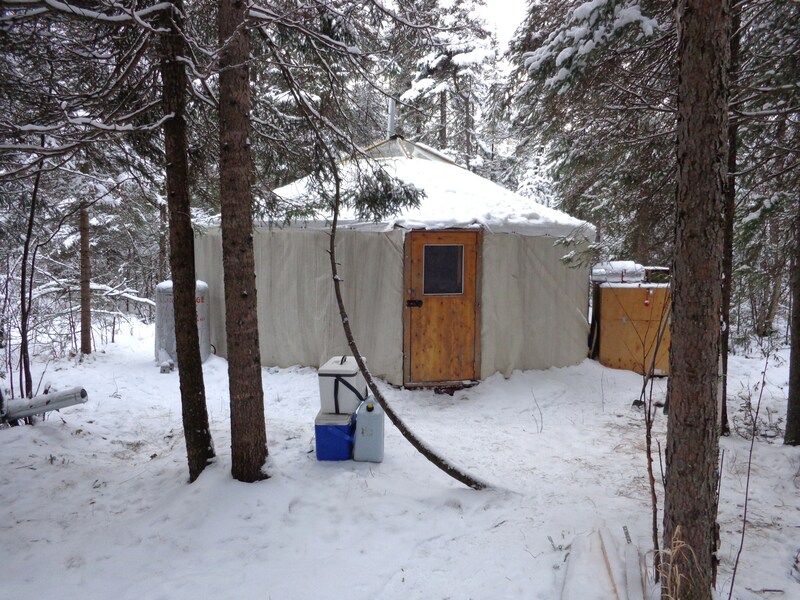 This was luxury camping that still gave the experience of being in the wilderness. Yes, the propane stove can stay. 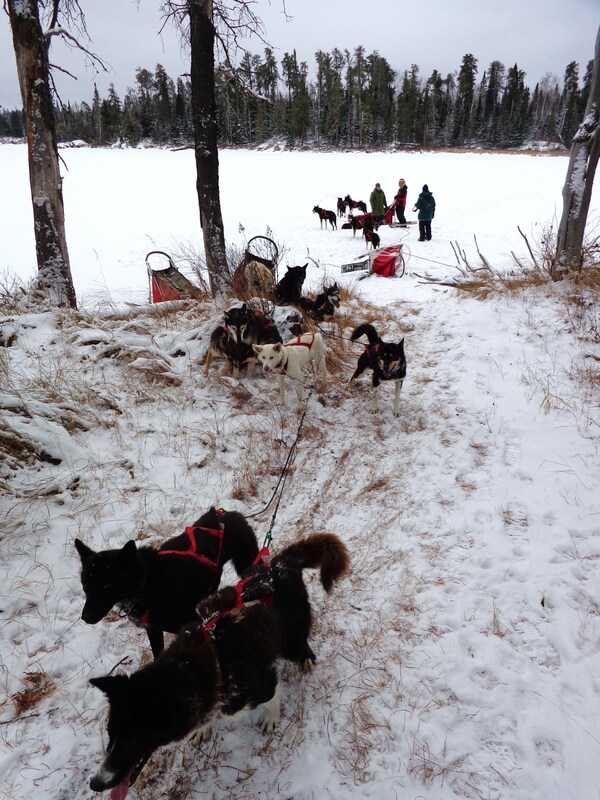 The only other client on this trip besides me was a lovely lady from Chicago named Annette, who was experiencing dog sledding for the first time. 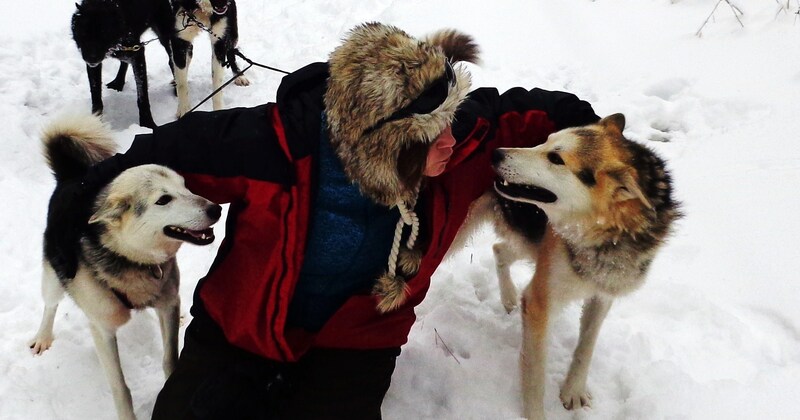 Along with our experienced, compassionate guides Heather and Risa, this made for a small, personable group; eighteen dogs and four humans. Our guides Heather and Risa were absolutely wonderful; they knew how to make us feel at home and had all the proper equipment to keep us warm. Every step of the way they made sure we had what we needed on the trail and at camp. They were friendly, experienced, and most impressively committed to the care of the dogs; so committed they slept outside with them. All the food on this trip was included; the meals were home cooked, delicious, and filling. 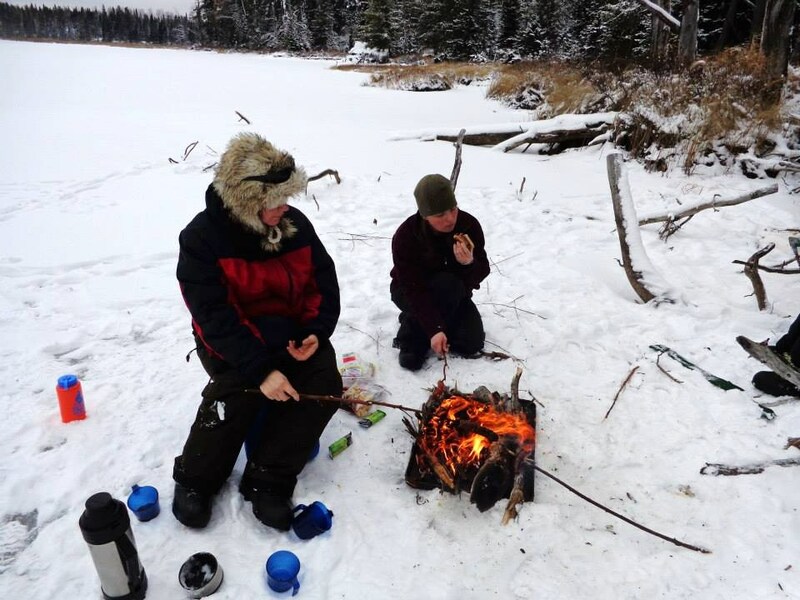 Nothing like eating lunch over an open fire while on the trail, which included a thermos of steaming, mouth-watering homemade soup previously prepared by owner Peter McClelland himself. Campfire dining, one of my favorites. 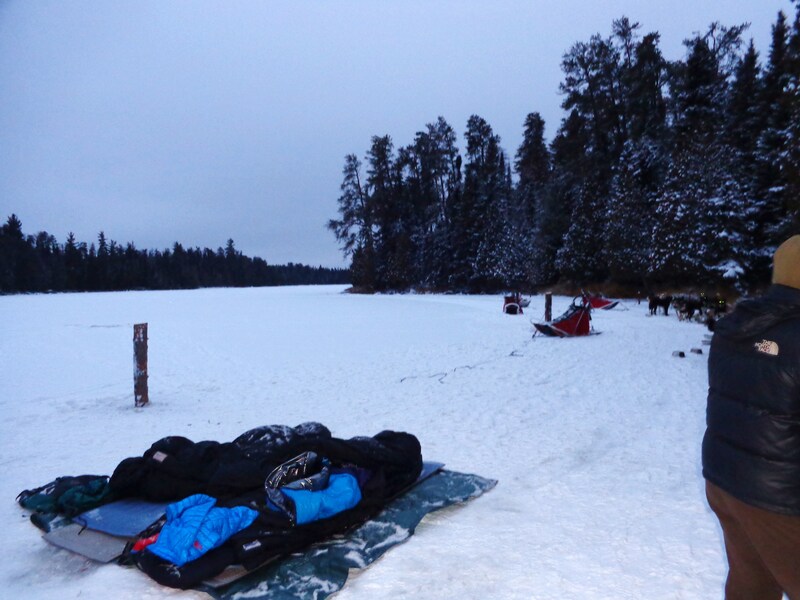 The last leg of that first day included a magnificent ride across the peaceful, frozen lake that brought us to our camp – a perfect way to end the day. After we unharnessed and fed the dogs, we gathered around the table to a wonderful meal prepared by Heather and Risa. There was something about dining after a full day of outdoor activity that was especially satisfying, and our cooks did not skimp on dessert! After clean up and a chat over hot tea, I looked to the cot with the comfy sleeping bag; I must say, it looked pretty good. We went to bed at 8:00pm, lights out. Those who know me are thinking, “no way” – I am a confirmed night owl – but our guides informed us that with no TV, computer, or other electronics to mess with our circadian rhythms, our sleep patterns would return to a natural schedule. I was amazed how quickly I fell asleep and stunned at how much energy I felt when I awoke around, say, 6:00 am. I am such a creature of habit that this really impressed me. There was no rubbing of the eyes or yawning; I could have even gotten by without coffee…if I had to. I do remember lying awake for a few moments to chat with Annette and listen for wolf howls before going to sleep; we never did hear any, but the dogs sang for us. They started slow, then began a chorus of howling that was hauntingly beautiful in its similarity to their wild cousins. Dogs maybe have more of their wild ancestry in them than we think. For me the high point of any experience is always the dogs. Naturally, I made it a point to visit each one of the eighteen dogs that accompanied us and give them milk bone treats. 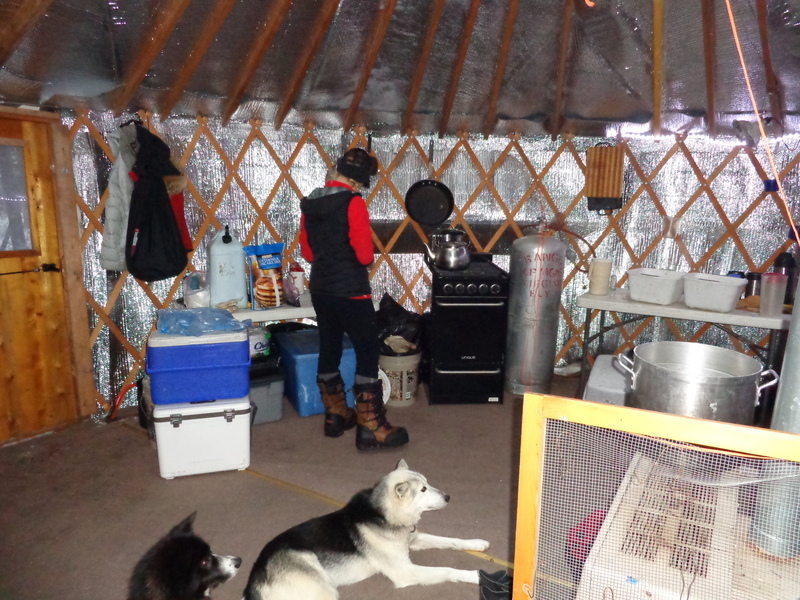 The dogs that pulled my sled got special attention, of course, and one of them named Misfit was actually a pet who came in and out of the yurt during the evening. I took advantage, and she enjoyed a mini training session and massage as tips for her efforts. She and the lead dog of my team, Shinook, found a special place in my heart. They were all pretty wonderful though, including the hearty rear runners on my team, Steve and Cetus. 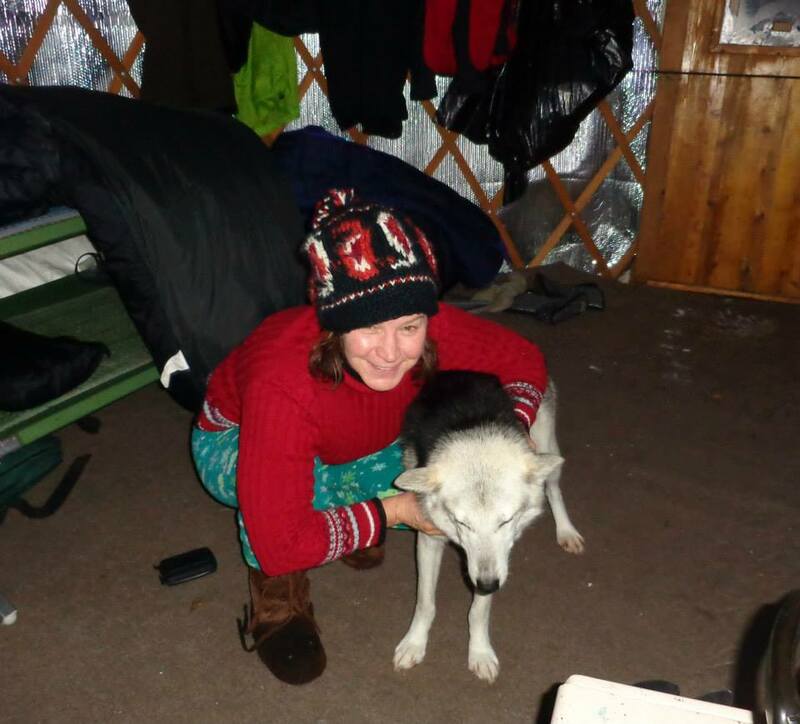 How often do you go camping in the Ely wilderness with eighteen dogs? My answer would be not often enough! There is just not enough space in a blog post to describe everything, but a few other highlights would be the other trails we experienced on days two and three. They were just so exciting, and though some were challenging due to low snow cover in spots, I loved every minute of it. 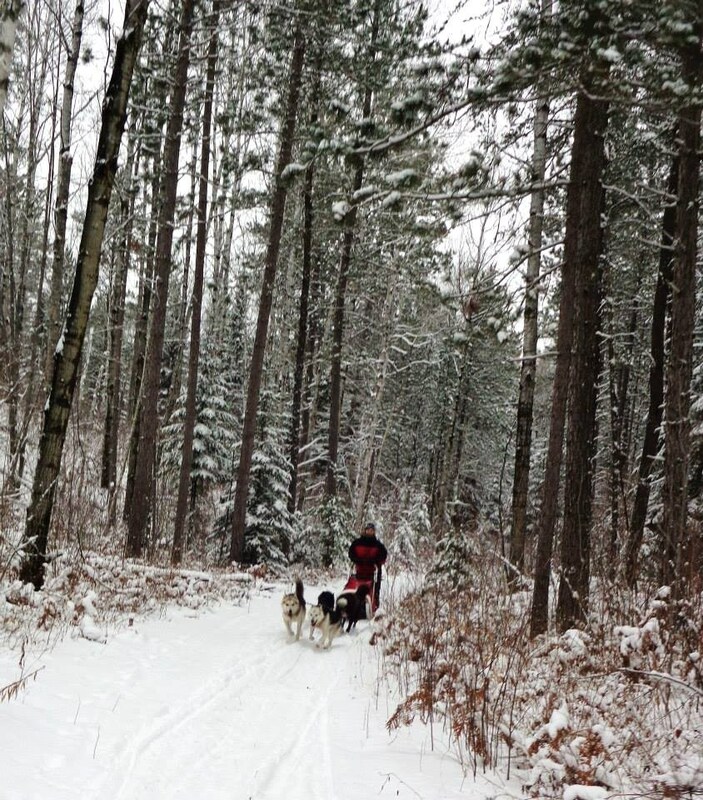 One trail in particular had me feeling as though I was in a sled dog video game, and I was winning every point. This is one bucket-list item I will be repeating; one could become addicted to this! 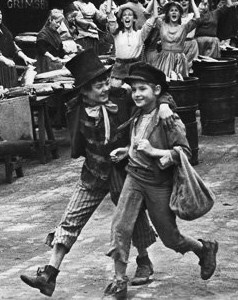 Jack Wild and Mark Lester in the 1968 hit musical “Oliver!” This picture and all pictures shown here are courtesy of google images; no infringement intended. Just as Jack Wild WAS the irresistible Artful Dodger, Mark Lester simply WAS the pure-hearted Oliver Twist. Was there ever a better recipe in all Hollywood? One could go mad having a crush on the late Jack Wild. 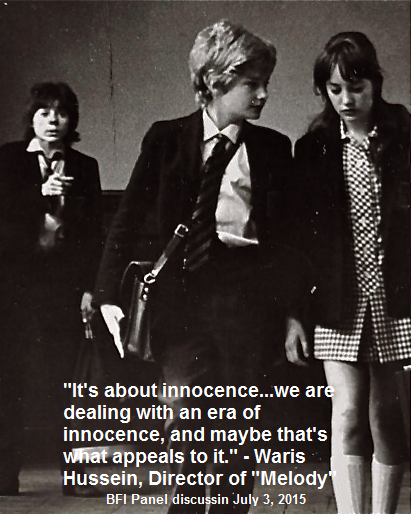 What was it about the charming British child actor from the late 60s that was and is so bloody compelling? 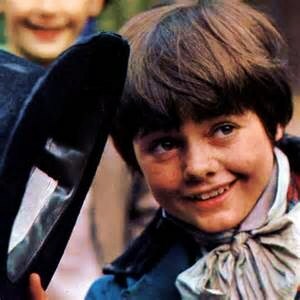 Countless young girls (and I dare say a fair share of adults) swooned over Jack, who stole their hearts as the Artful Dodger in the 1968 hit musical “Oliver!” Even Hollywood’s Oscar fell in love; his role as the Dodger won him a nomination for best-supporting actor. With such a spotlight on his fast-growing popularity, Sid and Marty Kroft soon handed him the role of the loveable Jimmy in the 1969 hit TV series “H.R. Pufnstuf;” every Saturday morning we gleefully welcomed him into our homes. As one of those young girls whose heart he stole, I can give you MY reasons for falling for him: His cheeky, maddening smile; his friendly, Cockney accent that on Jack was so irresistible; his warm, liquid eyes that could melt the coldest heart. The flame was rekindled for me late last year when I first discovered the 1971 British film “Melody,” which came out when I was ten years old. How could I have missed this perfect gem of a movie so full of young teen angst and Bee Gees music? I can only conclude that it mysteriously went highly underrated in the United States. 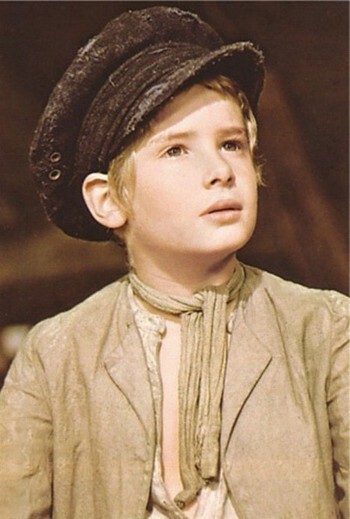 Mark Lester, who had the starring role next to Jack in “Oliver!,” melted hearts as the endearingly sincere Daniel; he became Ornshaw’s friend and confidant. As I watched “Melody” a second time, gaining new appreciation for every nuance of Ornshaw’s heart, I wholeheartedly tipped my hat to the talented Jack. The Dodger and Ornshaw were very different characters. 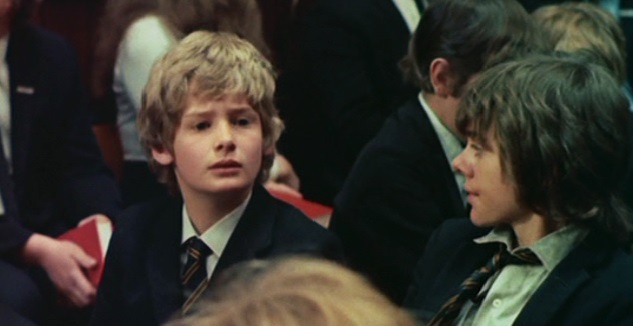 The fact that Mark Lester costarred next to him in both films occurred to me with growing curiosity; they certainly had the ability to light up a screen together. This movie was full of young teen angst relevant to today’s youth. Ornshaw (Jack Wild), Daniel (Mark Lester), and Melody (Tracey Hyde) in “Melody.” Ornshaw watches his best friend walk away with the girl. During the 1970s Jack starred in other movies and British TV shows, including the moving 1973 film “The 14” as Reg. While I applaud each and every one, in my heart the Dodger and Ornshaw remain on the top shelf as my favorite Jack characters. They strike a deeper chord with me than his other roles, and it seems to me Jack shines just a little brighter in them. 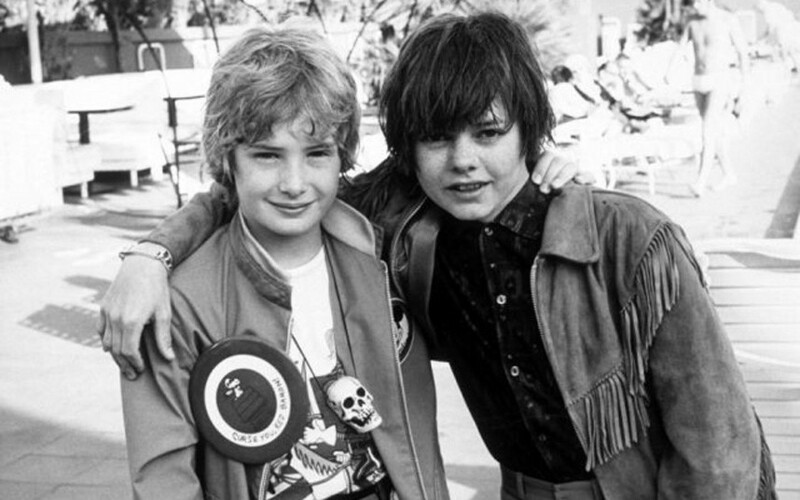 Did Mark Lester lend inspiration to Jack’s performances? After a bit of sleuthing, I strongly believe that to be the case. These statements resonate in me with deep conviction, and leave me smiling in warm appreciation. This chemistry was always very palpable to me in “Oliver!” and shines through in their performances in “Melody” as well. Some sources reportedly say that after “Melody” they were no longer friends, and completely went their separate ways. Granted their lives took them in different directions, but obviously theirs was a friendship that lasted beyond the relationships of everyday life; the type of friendship that lasts through time and distance. Jack had a natural charismatic charm and acting talent unrivaled thus far by any other child actor or Dodger ‘wanna be’. He had something ELSE, though, that will help ensure he goes down as the best Artful Dodger ever; he had Mark Lester for his Oliver. This would turn out to be the role of Jack’s life, and he couldn’t have had a better costar. While in many YouTube circles Mark’s contribution to “Oliver!” is erroneously underrated, Mark was a necessary ingredient in what could well be the most ingenious bit of casting in all cinema. The director Carol Reed could have searched every kid on the planet and not found a better Oliver to complement Jack’s Dodger. Mark Lester, who has his own following of fans, WAS the angelic, vulnerable waif, and he reflected the cheeky, streetwise Jack with brilliant light. Their energies and talents mingled and fit together like a perfect recipe in a science laboratory, and this recipe created incredible magic on the screen; a recipe that is not likely to be repeated any time soon…if ever. 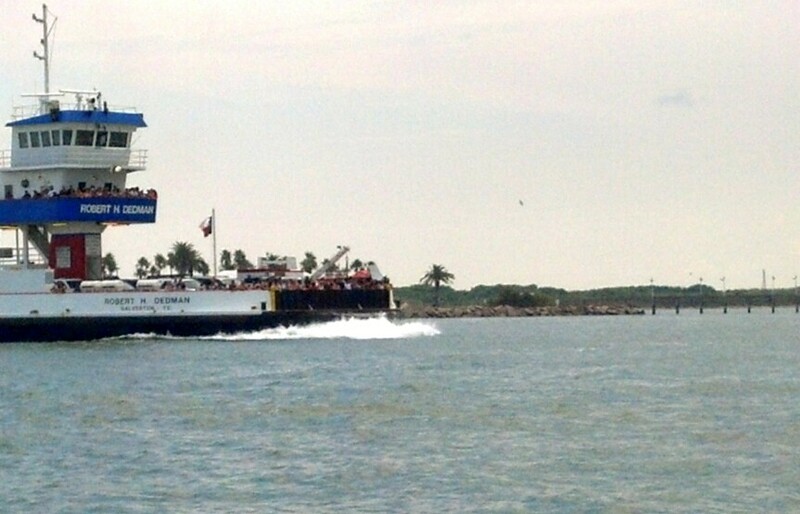 One of the other boats in Galveston Island Bay. Sorry the dolphins can’t be seen here! The captian on our little cruise boat made this statement a few times as we circled around Galveston Island Bay. I was just thrilled to be riding the waves, breathing in and thrilling in the salty air and climate of the tropical breeze, watching the wild dolphins jumping in pairs everywhere we looked. I was in the bow, my favorite spot, just relaxing and enjoying the moment. Filling my lungs with warm, moist air. My brother, sister-in-law and I were in Galveston for the day, and had unexpectedly found this little “Dolphin-Watch” tour boat, $10 for 45 minutes. I love being on the water, so this opportunity was a great treat. While we waited in line to board, the coastal air was hot and humid but this Minnesota girl didn’t mind, and there was a thin overcast haze, so the sun was not directly on us. As we stepped onto the little boat via a narrow gate, the friendly, grey-haired captain greeted us, and I was “lucky” enough to get the last outside seat right on the bow. I smiled apologetically to my brother and his wife. The captain was also our tour guild, and he pointed out all the docks and the big grey and blue ships in the harbor and gave his dissertation on what their different functions were. As he rattled on, I found myself more intrigued with the pelicans and terns who were dive-bombing for fish. I’ve seen pelicans and terns in my travels, but they usually played the role of scavenger behind boats and ships; these were quite amazing. Rising in the air as they flew across the water, they would reach a pinnacle in height, their head tilted and eyes zeroed in on their prey. Then suddenly they shifted, and beak first with their wings tightly pressed against their bodies they would dive into the water, making a splash and coming up with lunch in their bills. I wasn’t worried. I looked forward to getting a little wet. As we bounced across the waves, my face was merely treated to a fine sea mist, which was just fine with me. His warning seemed to me to be given out of legal necessity in case someone complained about a few drops of water. The shock of the force and completeness of Mother Nature’s joke was on me as I was, instead, treated to the drenching of a salt-water bath. As the boat dipped and careened, I literally had to hold on to the rail to keep from going overboard, my toes curled to keep from losing my flip-flops. Someone had just dumped several barrels of water over me, I was sure of it. My brother, who was safely seated inside, later told me that “The wave came in over your head” …yes, he said it with a laugh. You have no cause to pout. I was completely soaked; the wettest person on the whole deck. Even my purse, which was just inside the cabin, and its contents were wet. Apparently I had been in the perfect spot to take the brunt of the wave. I couldn’t help but laugh at myself, along with everyone else, and the captain just smiled and continued to steer his boat. When we departed, I slogged around in a wet, hot, humid mess. The temp was in the high 90s; I wasn’t cold. And as I changed out of my wet, sticky clothes in a local gift shop bathroom, where there was just enough room for me to turn around, I smiled at what a good time I had had for a mere ten dollars. My journey......in Idaho and other places I travel to.